Tonight concluded a four-game road trip that was not the most distinctive trip in the Warriors’ season, nor the longest. But with tonight’s win, it was one of the most vital, with a couple Kevin Durant-less and DeMarcus Cousins-less games bookending either side of the trip. It provided a chance for Andrew Bogut to make his return, and gave opportunities for role guys who have slipped down the pecking order. 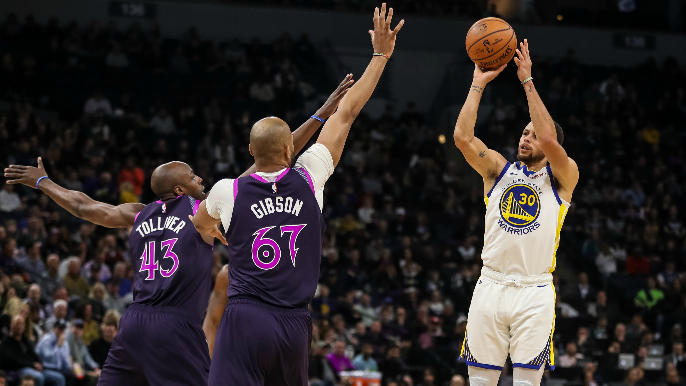 In addition to a tremendous bounce back game (more on that below), Stephen Curry hit a milestone which he’s made commonplace for himself: 300 3-pointers on the season. Stephen Curry just hit his 300th three-pointer of the season, giving him his third season with at least 300 threes. Curry hit an NBA-record 402 threes in 2015-16 and 324 threes in 2016-17. The only other player in the league with more 3-pointers than Curry this season is James Harden, who with 316, leads Curry (303) by just 13, despite Curry missing eight more games this season. Harden has taken an astounding 890 attempts (35.5 percent shooting from 3-pt) compared to Curry’s 706 attempts (42.9 percent shooting from 3-pt). At this point, Curry trails only Reggie Miller and Ray Allen in all-time 3-pointers made. Jerebko played 18 minutes and scored those 18 points on 6-of-10 shooting, 3-of-4 shooting from 3-point range, and a perfect 3-of-3 from the free throw line along with four rebounds. It’s his highest points total since the season-high 23 he poured in over the Dallas Mavericks on December 22 and the first time he’s logged 18-plus minutes since February 28 against the Orlando Magic. Last night featured some abysmal shooting from two of the greatest shooters in NBA history. Klay Thompson and Stephen Curry were woefully inefficient, combining to finish with 39 points on 14-of-43 shooting from the field (32.6 percent), and 10-of-27 shooting from 3-point range (37 percent). Both players rebounded tremendously, and led the team in scoring on plus-.500 shooting nights. With 35 assists on 39 made field goals, the Warriors have their 30th game with at least 30 assists this season.